These courtroom technology options are the key to customizing courtroom AV solutions with our unique approach to AV design and integration. All of the interactive and supporting hardware needed to make the option function within a Nomad AV System. 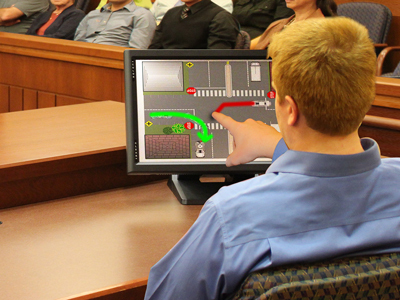 A secondary touch screen control panel at the bench lets the judge keep complete control over all evidence presented from the Nomad AV system. With the touch of a single button, the judge is able to instantly suppress or restore audio and video to all sensitive zones of the courtroom including jury, witness and gallery. When combined with a Judge’s Monitor, the judge is able to preview controversial evidence at the bench before it is presented to the jury. As an upgrade to the Judge Override option, advanced zone control allows the judge to independently control video suppression of up to four separate zones in the courtroom. 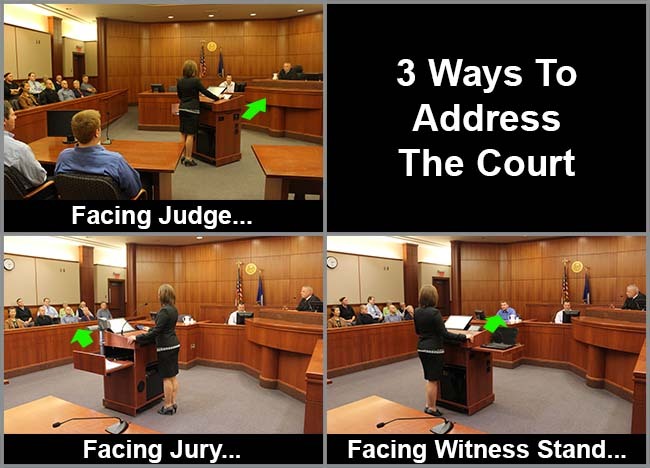 Which specific monitors/projectors fall into each zone is defined based on the needs of your courtroom. When the Nomad system includes the annotation option and the stand is equipped with a Witness Monitor, witnesses are able to use their fingers to make digital marks over any displayed image. This allows a witness to draw lines and highlight key information to effectively clarify the testimony. Separate colors and line styles allow the jury to easily differentiate between marks made by an attorney at the Nomad system and marks made by the witness. 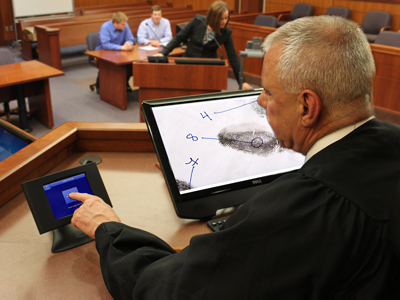 Viewing evidence on a personal monitor present at the witness stand can help witnesses properly comprehend the presented image. When the Nomad system includes the annotation option, a touch screen monitor is used at the stand so witnesses can make their own digital marks to help clarify their testimonies. When annotations are made over displayed images (by a witness or an attorney), it is important to be able to capture the screen exactly as it was seen by the jury. Screen images (with annotations) can easily be captured and stored on a USB drive, network storage device or printed to be entered into official court record. A monitor at the bench allows the judge a personal view of any evidence that is presented through a Nomad evidence presentation system. When combined with the Judge Override option, the judge can easily preview any controversial evidence and make a ruling before it is presented on other monitors in the courtroom. This allows a judgment to be made on evidence without first dismissing the jury. It is important that every juror is able to see presented evidence at the same time. The layout of the courtroom is often a determining factor in whether one large monitor is used for displaying evidence to all jurors or if multiple smaller monitors are placed throughout the jury box. It is common for each attorney table to have a personal monitor so evidence presented by opposing counsel can easily be viewed and analyzed. Depending on the layout of your courtroom, other personal viewing monitors may be needed for the court clerk, administrator, reporter, etc.